About an hour’s drive south of Tokushima train station in the village of Aratano is Temple no. 22 of the Shikoku pilgrimage route, Byōdō-ji – the temple of equality. If you stop at the main gate, the Daishi hall (Daishidō) is in front of you on your left, the temple office and other buildings are on your right, and the main hall (hondō) is located at the top of many stairs in front of you. In fact, there are three flights of stairs on the temple grounds. One with thirteen steps (the age of misfortune for children) is in front of the main gate. The second with forty steps (the age of misfortune for men) leads to the main hall and the third with thirty-three steps (the age of misfortune for women) connects the main hall and the Daishi hall. Add the three numbers together and you get eighty-eight. This is one proposed reason why there are eighty-eight sacred sites along the Shikoku pilgrimage route. In other words, by completing the pilgrimage and worshipping at all of the 88 sacred sites, one can prevent misfortune in one’s life. A stone path marker, made a few hundred years ago, in front of the temple office. It was discovered and placed here in 2015. At the foot of the stairs to the left, there is a small wooden hut with an opening at the bottom. Here you can scoop up well water that is said to be preventive for illnesses etc. Inside the main hall to the left are some wooden wagons used by pilgrims who could not walk during the pilgrimage, but were left here after the person was healed of their illness. 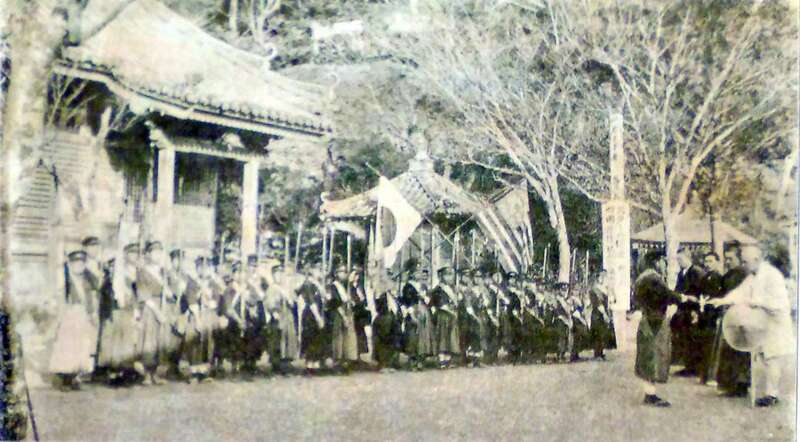 For example, one of the wagons belonged to a man from Tokushima who started the pilgrimage at Temple 1, Ryōzenji in 1927. He was pulled in it by his wife and uncle, but, by the power of Kōbō Daishi, was cured when he reached Byōdō-ji. 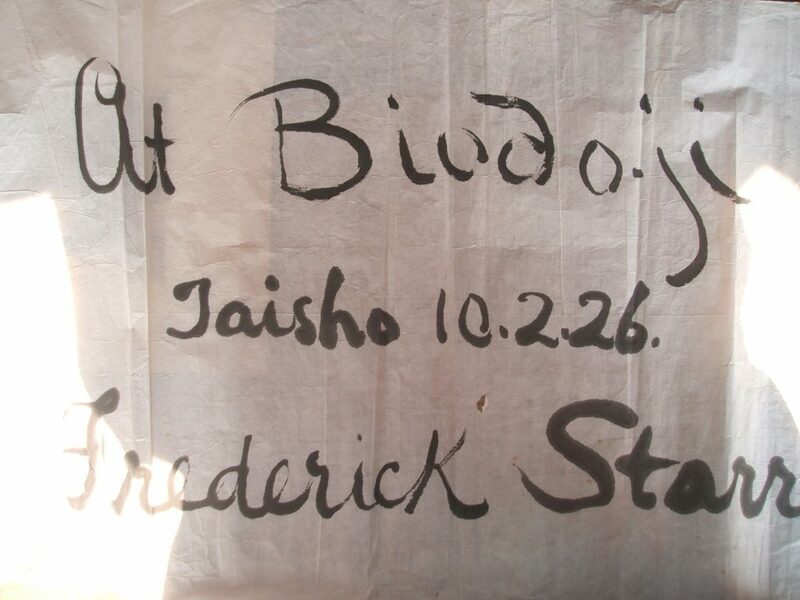 In 815, when Kōbō Daishi came to Aratano during his pilgrimage around Shikoku, a five-coloured cloud with a golden Sanskrit mark appeared in the sky. He was delighted to see such a sign and when he prayed to express his gratitude the mark transformed into Yakushi Nyorai and light shone from it in all directions. He then searched for water to conduct a ritual and when he began to dig in one spot with his staff milky-coloured water came gushing up. He purified himself with his water, conducted a one-hundred-day ritual, and carved and enshrined a statue of Yakushi Nyorai, which is revered as the Buddha of healing and medicine, as the main deity. This is the water that you can scoop up and take home now today, but unfortunately, the milky colour has disappeared. Later when the temple was most prosperous, there were numerous buildings on the grounds. 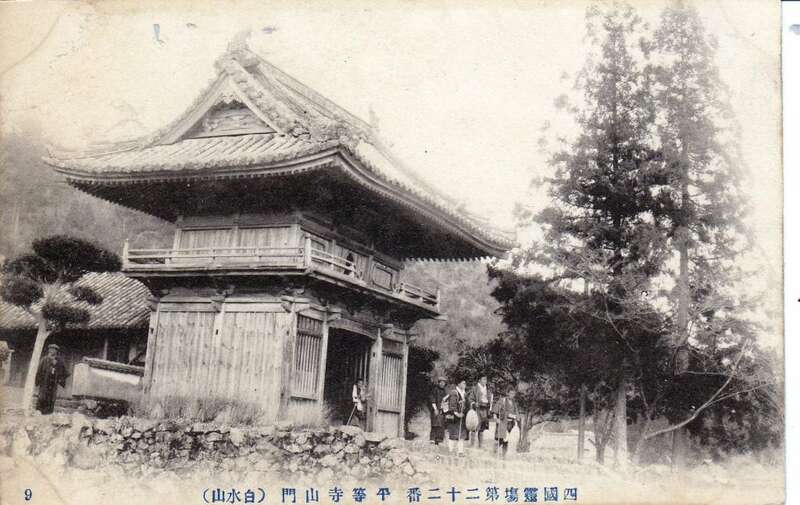 However, between 1573 and 1592, the temple was burned down by the troops of Chōsokabe Motochika, but between 1716 and 1736, the temple was restored. Throughout the centuries people with illnesses have come to this temple to pray to be healed, however, not all of the stories had a happy ending. In the spring of 1816, a pilgrim from a village in the northern part of present-day Okayama prefecture died of an illness in front of the temple gates of Byōdō-ji. A little while later a relative came to the temple and said, “A priest appeared and told me, ‘Your relative has passed away at Temple no. 22 in Shikoku.’ so that is why I have come here.” The priest of Byōdō-ji and the local people thought that this was a very bizarre story. Thirty-five days had passed since the person died, yet whether the relative was told by a priest or by the person who had died it is impossible, even if a messenger was sent, to go from Tokushima to Okayama prefecture in that period of time so everyone was so very surprised. Today people from around the world who have experienced the Shikoku pilgrimage feel the same way. Despite being different, they are treated equally. This article was first published in the February 2016 issue of Awa Life.